Managing the pharmacy benefit efficiently is no easy task. It requires quite a bit of time, effort and skill to do it right. Anyone with business training can look at a P&L statement and determine whether or not a company made a profit. However, understanding the story behind the numbers requires a certain set of skills only a certified public accountant can provide, for example. The same can be said for pharmacy benefits. Pick anyone from HR, finance or procurement and they will tell you succinctly the pharmacy cost trend is not sustainable. Ask these same professionals how to bend the trend (without increasing employee cost share, restricting access or reducing benefit levels) and you'll likely get crickets. You're probably thinking, that's why we hire brokers and consultants. I'll let the note Michael Critelli, former CEO at Pitney Bowes, sent to me address that point. "I am pleased that you wrote the particular essay I downloaded. Many corporate benefits departments do not understand that they are overmatched in negotiating with pharmacy benefit managers, as are the "independent consultants" who routinely advise them. The first step in being wise and insightful is admitting what we do not know, and you have humbled anyone who touches this field." For those interested in improving their company's pharmacy benefit management results and unafraid of unconventional concepts, here are 10 steps in the right direction. “The illiterate of the 21st century will not be those who cannot read and write, but those who cannot learn, unlearn, and relearn.” — Alvin Toffler. Education is the most logical and effective foundation for achieving extraordinary results in pharmacy benefit management services. In order to improve on the job execution and career growth, benefits consultants, finance managers, procurement and HR professionals must expand their PBM knowledge beyond a functional role and understand exactly how each domain works together within the pharmacy distribution and reimbursement system. Don't be a spendthrift learn the intricacies of managing pharmacy benefits like a pro. unsophisticated plan sponsor purchaser to their financial advantage. There are several ways to learn about the specific services and fees of those PBMs. One, the request for information (RFI) is a shorter less-structured instrument compared to RFPs. It asks a handful of PBMs to answer some very targeted questions. The responses to those questions should be scored automatically based upon a set of predetermined criteria. 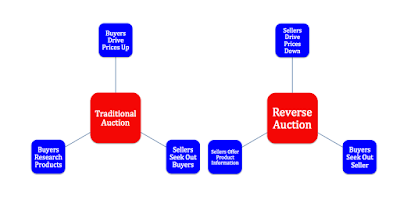 When coupled with an automated reverse auction, the RFI can be a powerful tool in combating high PBM service fees. 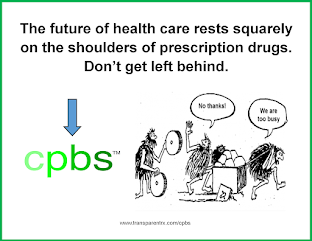 PBMs have gotten so good at RFPs that they've just become a marketing tool for the PBM. The contract [language] is the white elephant purchasers seem to ignore or not pay nearly enough attention. Caterpillar Inc. is one example of a large employer that took an active role and did something disruptive to deal with pharmacy spend. “We carved out a lot of the strategic decisions PBMs make on behalf of employers and made them ourselves,” said Todd Bisping, global benefits manager at the Peoria, Illinois-based heavy equipment manufacturer. This shift of strategic power began in the mid-2000s, he said. Caterpillar still uses a PBM, Optum, for tasks like prior authorizations, customer support lines and some step therapies. When they started this process over a decade ago, they were using Milwaukee-based Restat, which was bought by Catamaran in 2013. Optum then acquired Catamaran for $12.8 billion in 2015 and renamed the company Optum Rx. Caterpillar opted to build its own networks — that is, determine which pharmacies to contract with and give its members access to — rather than relying on a PBM to do so. It decided to determine its own pricing methodologies in contracts rather than using PBM-negotiated drug prices. It also designed its own formulary, a list of brand name and generic prescription drugs that employees covered by a specific health care plan can use. Sophisticated purchasers or those persons with advanced negotiating skills should lead the procurement of PBM services. An in-house team of PBM "consultants" may or may not fill this requirement. Most PBM consultants (95%) can't pass our quiz which assesses basic levels of pharmacy benefits comprehension. Which leads me to the second point. You want someone or a team who knows the ins and outs of how PBMs go about their business of protecting margins and designing plans. Some decision-makers assume pharmacists know better than anyone else how to evaluate PBM performance and nothing could be further from the truth. In fact, the business of pharmacy benefits isn't taught in most Pharm.D. programs. Because purchasers rely too heavily on it, analytics can actually exacerbate the problem. In other words, don't depend solely on algorithms or analytic software programs and the neat dashboards from which they display information to save the day. This is especially true if the data points being measured are inherently flawed (i.e. AWP and MAC). Some day AI or artificial intelligence will eliminate the need for humans to evaluate contracts for loopholes, but we are not there yet. So a word to the wise, there is a significant human element at play in managing pharmacy benefits efficiently. When conducting a side-by-side claims analysis it is a disservice to plan sponsors for brokers and consultants to determine best price from only the claims data before them. Instead brokers and consultants must view the data holistically and ask, "if the plan were being managed efficiently, what should the final plan cost for this group have been?" A claims analysis or re-pricing looks primarily at retrospective pricing which is a good starting point but no where near telling the whole story. For example, it doesn't always take into account poor product mix or bad utilization from which non-fiduciary PBMs intentionally profit. 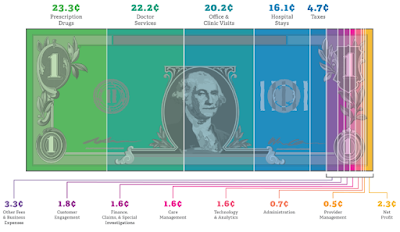 This profit is more or less a service fee, which is hidden in the plan sponsors final cost. Any cost analysis which doesn't take into consideration utilization or product mix falls short of telling the entire story. 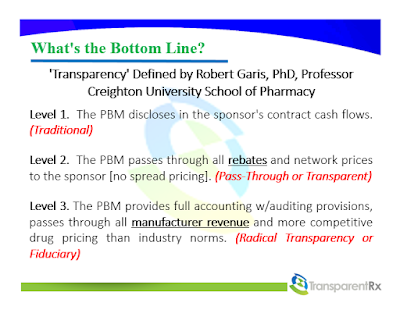 There is one immutable truth plan sponsors and their advisers can rely upon when it comes to purchasing PBM services and that is PBMs will provide transparency and disclosure to a level demanded by the competitive market and generally rely on the demands of prospective clients for disclosure in negotiating their contracts. Note: Level 3 includes both levels 1 and 2. 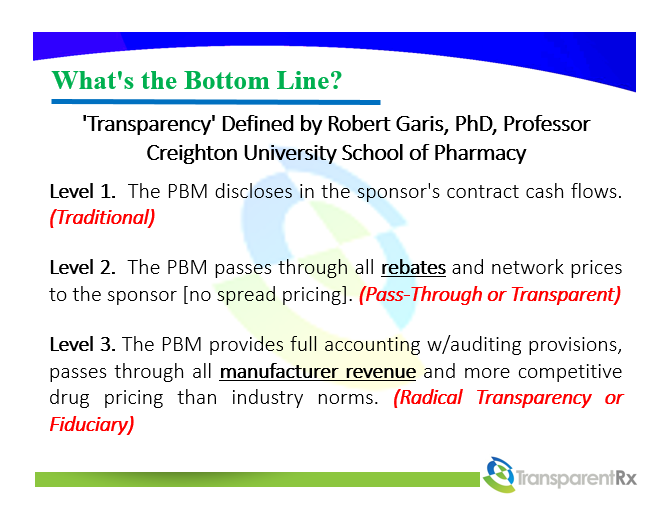 The best proponent of transparency is informed and sophisticated purchasers of PBM services. Assessing transparency will be more effectively done by a trained eye with personal knowledge of the purchaser’s benefit and disclosure goals. I wish I could take credit for the last three sentences, but I can't they come from URAC. Smart purchasers of PBM services want more control over their plan design not less. If this is you, here are six pillars upon which to design your pharmacy benefit plan. Once a plan is in place there must be ongoing evaluation (far beyond standard reports) to determine how well the plan is achieving the goals and objectives upon which the plan is based. Critical to the process is the availability of data. You would be wise to negotiate unrestricted access to this data upfront; before the contract is signed. Despite what you've been told, traditional, transparent and pass-through business models are all the same. They are nothing more than a play on words. The only PBM business model which provides a client-comes-first standard of care is a fiduciary one. Education is a kind of insurance policy in verifying the trust you've placed in your PBM. This video answers the question how can a boutique pharmacy benefits manager compete [price] with a behemoth PBM. Click below to watch. PBM performance should be monitored on an ongoing basis with a formal business review no less than annually. The types of routine monitoring activities performed by the plan sponsor can vary based on past performance with the PBM or the nature of the services performed. The type and frequency of monitoring should be documented in the contract before it is executed. The plan sponsor should establish key performance metrics designed to measure the PBM's services. For example, if the plan sponsor delegates call center operations to a PBM, then the performance metrics should include, at a minimum, hold time, average speed of answer and abandoned rate. The PBM oversight program must also define what happens if the vendor’s performance is below the plan sponsor’s performance expectations. When noncompliant performance occurs, the plan sponsor should request a formal action plan defining specific activities to ensure performance meets the defined expectations. Depending upon the severity of performance, the plan sponsor should consider increasing monitoring and audit activities of the PBM. There is nothing illegal about the contracts non-fiduciary PBMs present to their clients. Subsequently, some of the largest companies in the world (see Anthem vs. Express Scripts) think they are protected because they have in-house and outside attorneys vetting these contracts and that simply is not necessarily the case. The thing is, assessing transparency is more effectively done by a trained eye. Someone who knows the ins and outs of PBM revenue models, contract loopholes and has personal knowledge of the purchaser's plan goals. This blog post was authored by Tyrone D. Squires, MBA, CPBS. Tyrone has been in the PBM, managed care and pharmacy industries for 15 years. He has started and operated PBMs, business process outsourcing firms, retail and mail-order pharmacies. Over the years his clients include a diverse group of health insurance carriers, HMOs, TPAs, and self-insured employers. Presently, he serves as Founder and Managing Director of TransparentRx a fiduciary pharmacy benefits manager. Mr. Squires is author of the blog, “A Payer’s Guide to Managing Pharmacy Costs” and has written several white papers on pharmacy benefits cost containment techniques. Mr. Squires can be reached at TransparentRx’s office in Las Vegas, Nevada at 702.990.3559 or by email tyrone.squires@transparentrx.com.